Published Nov 12, 2012 by Prentice Hall. Part of the LiveLessons series. iOS 6 App Development Fundamentals LiveLessons is unique among iOS videos published today--it's the only one that takes a complete "app-driven" approach to teaching iOS programming. 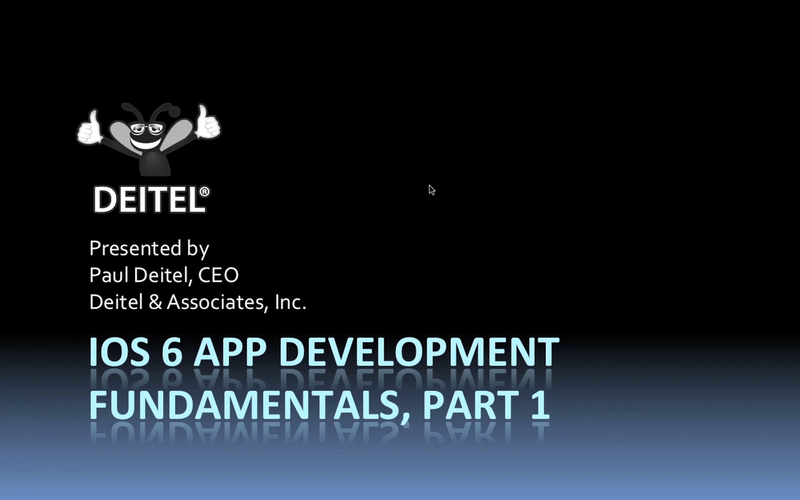 Expert video instructor Paul Deitel teaches key iOS 6 concept in the context of fully coded and tested iOS 6 apps. You learn iOS 6 as you build great iOS 6 Apps! This LiveLesson is ideal for people familiar with object-oriented programming in Java, C++, C# or Objective-C (an Objective-C background is not required). This lesson explains how to install and configure the Xcode IDE, and what to expect when you first run Xcode. This lesson explains how to load an existing App into Xcode and how to run the App within the iOS Simulator that's part of the iOS SDK. This lesson explores how to build a GUI-only app from scratch. You learn to use the Interface Builder tool that is integrated into Xcode. This App also introduces some of the iOS SDK's accessibility and internationalization features and capabilities. This lesson introduces Objective-C. You learn to build more complex GUIs using Interface Builder's auto-layout and story-boarding features. This App introduces more complex features including iCloud and social framework sharing, and how to store user defaults on the user's device.